Climb aboard for a magical carpet ride with nonstop laughs, action-packed adventure and Academy Award–winning music that will make your heart soar (1992: Best Music, Original Song, “A Whole New World,” Original Score). Now for the first time ever, a whole new world of Disney’s Aladdin is revealed in a whole new way on Blu-ray and Digital HD—with never-before-seen bonus! With the help of a hysterically funny, shape-shifting, 10,000-year-old Genie, street-smart commoner Aladdin and clever, confident Princess Jasmine join forces against the evil sorcerer Jafar to put an end to his plans to take over the kingdom! With the start of the Disney Renaissance beginning with The Little Mermaid and continuing with Beauty and the Beast, the company was on a roll with films that were embraced by the public and critics alike. I enjoyed both of those movies at the time, but I remember getting very excited in 1992 that Aladdin would be centered on a male protagonist and promised a more action packed and adventurous tale than the previous installments. The film was everything that I hoped for and more as it delivered all of the adventure, heart, and laughs that I wanted. For awhile, I had begun to believe that the Disney movies were made just to sell soundtracks with the movie itself regarded as secondary to the music although I did enjoy The Little Mermaid soundtrack. For Aladdin, the songs were not only funny and catchy, but they also served a purpose as they helped propel the story. 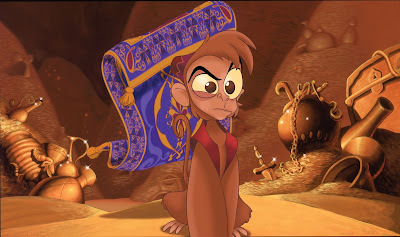 The film centers around a young man named Aladdin (Scott Weinger), a diamond in the rough, who spends his time stealing food from Agrabah merchants with the help of his monkey Abu (Frank Welker). Aladdin is something of a Robin Hood figure as he also steals to feed homeless children and doesn't hesitate to help those in need like a disguised Princess Jasmine (Linda Larkin) who almost has her hand cut off for stealing an apple for a hungry child. Thanks to Aladdin, Jasmine escapes injury and is given a tour of the world outside of the palace that she had never seen. Jasmine has tired of living in the palace and has no interest in being forced to marry a prince in three days thanks to a law that she doesn't agree with. While Aladdin dreams of living in the palace and living in the splendor it offers, Jasmine seeks to escape it and all of the responsibilities that accompany her position. Jasmine's father the Sultan (Douglas Seale) has been trying to find a suitor that Jasmine approves of, but all of his efforts have been in vain as all of them have been pompous and too arrogant for her. His grand vizier Jafar (Johnathan Freeman), who has been searching for a magic lamp that contains a Genie, sees an opportunity to obtain the power he desperately craves and hypnotizes the Sultan into agreeing to let him marry Jasmine if a prince isn't found in time. 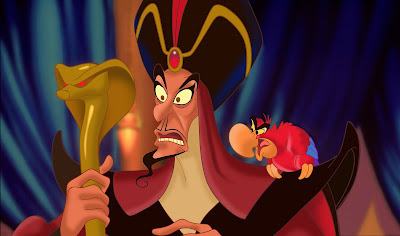 Jafar has already learned the location of the Cave of Wonders where the lamp is located, but after sacrificing a low level thief he knows that only someone worthy and good can enter the cave, he learns that Aladdin is the diamond in the rough that he needs. 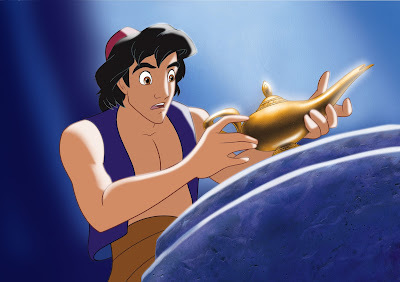 Aladdin is tricked into entering the cave to get the lamp, but thanks to Jafar's treachery, Aladdin is the one who gets possession of the lamp and is also the benefactor of its three wishes from the Genie (Robin Williams). 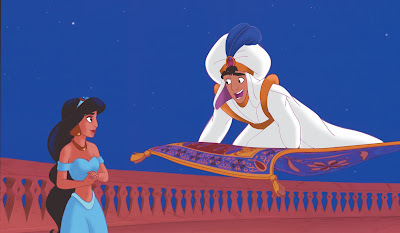 Determined to circumvent the rule that Jasmine can only marry a prince, Aladdin promptly wishes to become a prince which starts off a chain of events that puts them all in peril from the power hungry Jafar when he gets a hold of the lamp and gets his own three wishes. It's an experience that teaches Aladdin that it's always best to just be yourself and the power of selflessness. I've always loved everything about this movie. 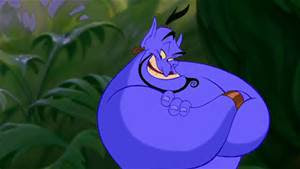 The visuals, the humor, the perfect casting, the songs, and especially Robin Williams as the Genie are all perfect. The script was written with Williams in mind and then they let him improvise freely during the recording session, which resulted in a brilliant distillation of Williams' stream of consciousness comedy. His multitude of impressions and his manic energy really elevate this movie and it was already really good to begin with. All of the voice cast do an incredible job in their roles, especially Scott Weinger's winning performance as Aladdin and Jonathan Freeman provides us with one of Disney's best villains. Aladdin is without a doubt, one of Disney's best movies ever made. This 1080p (1.85:1) transfer is just stunning to see and well worth the long wait it's taken for this movie to make its high definition debut. Colors are vibrant and pop off the screen and the level of detail is amazing. This film looks like it was released six months ago and it's the best that I've ever seen it (I own at least two other versions of this movie). The black levels are solid and pitch black as they should be and the contrast is spot on. There's no major digital defects or other blemishes to complain about as this transfer looks completely pristine. This transfer is reason enough to buy this diamond edition. 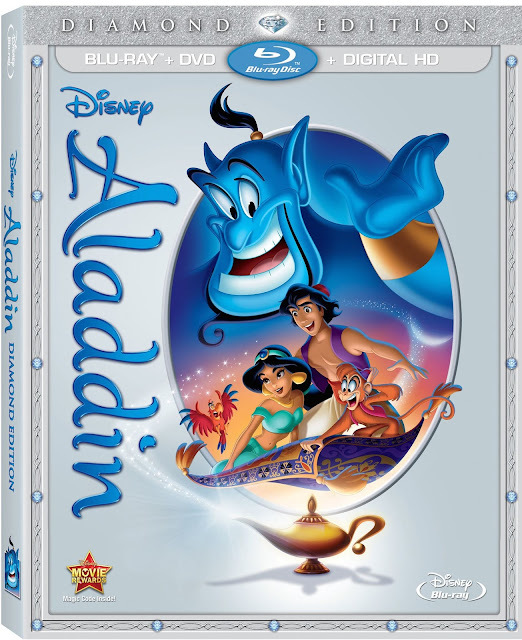 Aladdin's DTS-HD Master Audio 7.1 mix maintains Disney's track record of incredible audio presentations. In every way possible, this lossless mix delivers the action, atmosphere, and music in spades and it really brings the movie to life. Dialogue is clear and clean sounding and prioritized accurately. The songs have never sounded better and rear channels really do an excellent job creating a sound-field that adds a lot of atmosphere and correctly positioned directional effects. This is a fantastic mix and one that will make fans very happy. There's a ton of extras on here as the previous releases' special features have been ported to this disc and it offers some new ones as well. Some of them are good and some of them like "Unboxing Aladdin" aren't so good. I prefer the classic extras over the new ones with the exception of the new ones devoted to the Genie and Robin Williams. 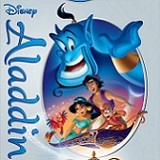 Audio Commentaries - There's two commentaries included with one of them featuring the directors John Musker, Ron Clements, and co-producer Amy Pell,and another one devoted to the Disney supervising animators Andreas Deja (Jafar), Will Finn (Iago), Eric Goldberg (Genie), and Glen Keane (Aladdin). The Genie Outtakes - John Musker, Ron Clements and Eric Goldberg offer this tribute to Robin Williams as they share some of the outtakes from Robin Williams' recording sessions. This doesn't include any actual footage of the recording session but we do get some rough animation to let us know how it could have looked. A lot of these outtakes were pretty funny so it's too bad they didn't make it in the movie, but I guess they had a an abundance of riches from Williams to choose from. Aladdin: Creating Broadway Magic - At almost twenty minutes long, this extra gives the viewer a very good idea of the effort involved in creating a successful Broadway show. We get to see and hear about the entire process and even get to see some clips of the final show too. This extra is hosted by Darren Criss. Unboxing Aladdin - In another example of Disney synergy, they once again have one of their Disney Channel stars (in this case Joey Bragg) get involved with a movie that they had nothing to do with. I have to be honest and say that I hate it every time they do this. In this extras, Bragg reveals easter eggs from the movie (that really aren't that hidden) and acts silly. It's only five minutes long but it feels a lot longer. 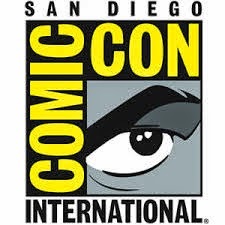 Genie 101 - The voice of Aladdin Scott Weinger guides any uniformed viewer of the various 90s pop culture references made by the Genie. For young kids that weren't around when it was released, it might be helpful, but telling them that Robin Williams was impersonating Jack Nicholson doesn't necessarily make them get the reference either if they aren't familiar with him. Ron & Jon: You Ain't Never Had a Friend Like Me - This is a six minute looked at the long time friendship between the directors, John Musker and Ron Clements. They talk about how they met and how they decided to work together. It's nice to see that they are still friends and that they still meet almost every day for lunch even if their presence reportedly causes restaurants to go out of business as they are self described restaurant "coolers." Deleted/Alternate Scenes - "Aladdin and Jasmine's First Meeting," and "Aladdin in the Lap of Luxury,"
Music Videos - "Proud of Your Boy" with Clay Aiken, "A Whole New World" with Jessica Simpson and Nick Lachey, and "A Whole New World" with Regina Belle and Peabo Bryson. Behind the Scenes of "Proud of Your Boy"
Behind the Scenes of "A Whole New World"
Aladdin is one of Disney's best movies and they've done it justice with this spectacular Blu-ray release that offers some amazing video and audio quality as well as some fantastic special features. This is the version that you've been waiting for and if you are debating on whether or not you should upgrade to this Diamond Edition Blu-ray, the answer is a resounding yes!